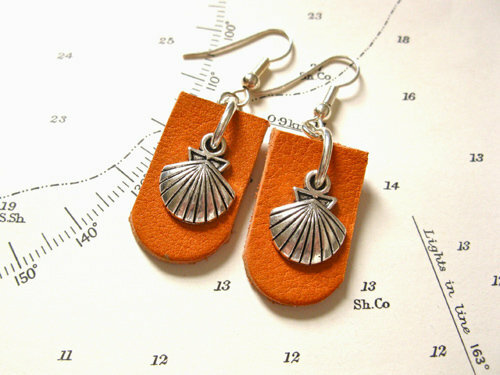 These simple scallop-shell earrings would make an ideal present for a lady setting off to walk the Camino de Santiago or for some other event in their lives with challenges and goals. The scallop shell shape of the concha symbol of El Camino, is highlighted and stands out against the darker leather background, and so makes a truly striking piece of jewellery with meaning. The 1,000-year-old Way of St. James (El Camino de Santiago - in Spanish), criss-crosses Western Europe, arriving at Santiago de Compostela in Northern Spain on the Atlantic coast. Some 200,000 people travel to the city each year from all over the world: Some people walk, others travel by bike. Many travellers choose to do the Camino for personal, rather than any spiritual or religious reasons - taking time out from their busy, modern lives and perhaps finding inspiration along the way, whilst reflecting on their lives in a supportive environment. 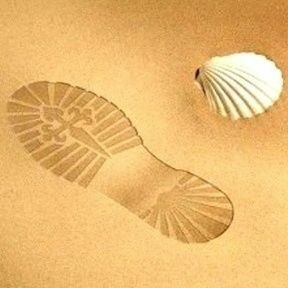 Many carry with them Scallop shells like this as a symbol of safekeeping. Everyone experiences the journey in a different way. Wish your friends or loved-ones well by sending them this inspirational present. These earrings make the ideal gift for any special event / occasion or for people as they travel through life and face its challenges: They show someone that you really care. Dimensions: The earrings measure approx 48mm in length from the top of the hook to the bottom of the leather. leather is 15mm wide. As these are handmade of real leather, colours may vary slightly from the photos. Whatever somebody’s journey - whether on El Camino itself, on holiday, a business trip, a gap year, trekking, etc, many friends and loved-ones like to pass on a special gift to wish the recipient well on their travels - and safekeeping along the way. These earrings are perfect for that purpose. In addition to any value that the Camino charm symbol has in itself, or the religious faith that it might represent, these earrings can also act as a reminder to be careful when travelling. And this can be a powerful aid to staying safe whilst away from home. Gift these unique leather scallop shell earrings to inspire your friends and loved-ones, and encourage them to be safe as they travel life's journey. They come gift-wrapped, like all our presents - and we can print a personal message on your behalf.